I remember the first time I visited New Orleans. My family was on vacation to the Gulf Shores, but I insisted we detour a few hours south so that we would pass through the Crescent City. As it was our first time in New Orleans, we headed straight for Bourbon Street (naturally! ), where I ate my first shrimp po’ boy and tasted my first Hurricane. Those few short hours were my favorite part of the whole trip. The sights and smells stayed with me. Little did I know that 11 years later I'd be twirling my tassels just a few blocks down the road! I grew up a theater kid. I always enjoyed playing dress-up. And I loved musical theater and the whole era of vintage glamour. So all the glitter and the pageantry of burlesque was a natural fit for me. And if a girl’s going to do burlesque, what better place than in La Nouvelle-Orléans? There’s nothing quite like performing in New Orleans, where they’re always ready to let the good times roll. No other city I know stays so faithful to the traditions of burlesque, embracing not just the striptease, but the comedy, the musicality, the glitz and glamour of it. The stages here are bigger, the lights a little brighter, and the jazz bands livelier than anywhere else. Stepping on stage here, I feel like I’m part of something bigger than life. And that goes for the incredible audiences as well. In the Big Easy, everybody is just a little bit more rowdy; people feel like they can go a little wild and let down their inhibitions. Such a dynamic audience combined with an amazing live jazz band creates something magical. It’s easy to push it over the top, to give my performance that extra oomph, to be just a little bit naughtier. Performing at the New Orleans Burlesque Festival has been amazing not only for the experience itself, but because the festival attracts so much talent from around the world. It has been such an enormous privilege and honor to serve this past year as the New Orleans Burlesque Festival Queen of Burlesque. This past year has been as wonderful as it has been hectic. So many great opportunities opened up for me – my first time performing not only in New York and all over the United States, but in Europe as well. Being the reigning queen has inspired me to work harder, to push myself to be the kind of performer burlesque aficionados want and deserve. While I have been incredibly busy, I feel so lucky to have been given the chance to travel and perform as much as I have this past year. And I am even more lucky for the great friendships I've forged and for the friends who have stood by me this past year and given me the support I couldn’t have survived without. I first want to thank all the ladies who went before me and laid a path for me and my sisters of striptease. I am supremely lucky to follow in the high-heeled footsteps of legends such as Tammi True, Tiffany Carter, Gypsy Rose Lee, Candy Barr, and Lili St. Cyr. And of course without producer Rick Delaup and his huge passion for burlesque, there would be no New Orleans Burlesque Festival. I appreciate his dedication to this art and to making sure that it thrives and that all the ladies of burlesque thrive along with it. 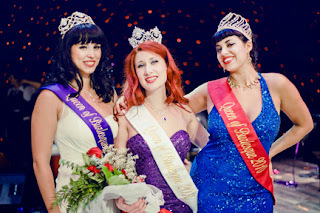 All my love and appreciation to my dear friend Ginger Valentine, the 2011 Queen of Burlesque. I have spent a lot of time with her through the years in packed cars and tiny hotel rooms, on our way to perform. She played a huge role in helping me prepare for the festival last year and guided me throughout my reign. I am so lucky to have someone like her on call who is always patient with me and who I can go to with all my awkward questions. She brings her best to every situation. She keeps me focused and pushes me to never settle, to constantly be better in my own wacky way. I'm incredibly lucky to have her for a friend and mentor. I also cannot forget Missy Lisa, Renea Holiday and all my friends at the Ruby Revue. Dancing with these ladies always pushes me to shine. I love them all like sisters. And a big hug and kiss to Black Mariah, my costumer and partner in crime, who keeps me grounded. And of course I can’t leave out Owen. He has been incredibly supportive of my art and dedicated to helping me achieve my goals. I really appreciate the way he never looks at me as if I am crazy, no matter what wild idea I come up with – such as the time I wanted to knock a hole in the ceiling of the house to install my trapeze – but instead, he finds a way to make it happen. And that’s the best advice I can pass on to the lucky lady who will be crowned Queen of Burlesque for 2013. Be the best. Don’t settle for staying in one place, but push yourself to go further and higher than you have ever gone before in your performance, in your opportunities to experience new places and to meet new people. Be seen. Embrace the new opportunities you will be given. Spend the next year dedicating yourself to the art of striptease. Figure out what makes you unique, what is the best you have to give to your audience and be ready to give it to your fullest. This is your time to shine. And take care of yourself. Even when the pace gets brutal, take time to be nice to yourself, treating yourself to a favorite meal or a new dress. You deserve it! And don’t forget I am here for you should you need anything, whether it is advice, someone to listen to you, or someone to share a few drinks and a few laughs with.